Apart from 2 lunches and 2 dinners to be taken ashore, all inclusive 7 day holiday complete Captain's bar and guaranteed excellent cusine tailored to your preferences. The Crew on Cool Runnings will be sure to pay attention to detail ensuring an unforgettable sailing holiday. Cool Runnings is a Leopard 45 catamaran, owned and run by Geoff and Bambi Alexander who provide a warm welcome aboard to all their guests. 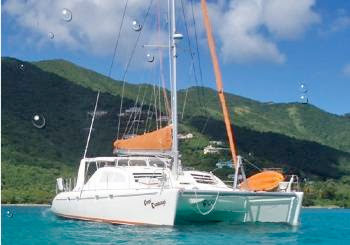 This catamaran has a great charter pedigree and is a former Cruising World Boat-of-the-year. She features four lavish queen-sized cabins each with ensuite heads and showers, three of which are available for our charter guests. Cool Runnings is fully air-conditioned and for guests enjoyment, has CD, DVD and TV as well as plenty of games. Her tender is a 12-foot rib with an engine powerful enough to pull you or your guests around the bay. She also has a two-seater kayak and noodles and floaters for the less active guests. She has enough snorkels and fins for everybody and for the more adventurous. Scuba diving and windsurfing can always be arranged. Some of the best diving in the world is in the BVI, which includes the wreck of the RMS Rhone, which featured in the movie “The Deep”. There is a wide choice of walks and National Parks to be explored and there are numerous attractive beach bars and restaurants around the Islands.